Hello there! It is almost a month that I have not written on this blog. I have a lot of recipes to write about. 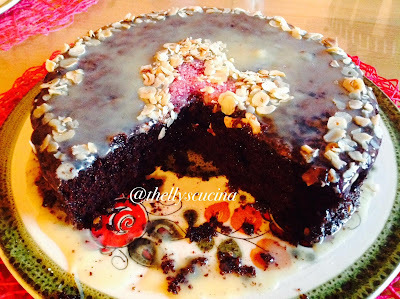 Food that I have tried and tasted in my kitchen. Food that is usually not planned but made out of "scratch". The ingredients which I do have in my fridge. Today, I have cooked a delicious meal. I have stir-fried the cabbage that was leftover from my cooking a few days ago. I love cooking from leftover veggies like this fried rice made from leftover rice. Heat the oil in a wok. Then add the bacon strips. Fried until golden brown. Set aside. 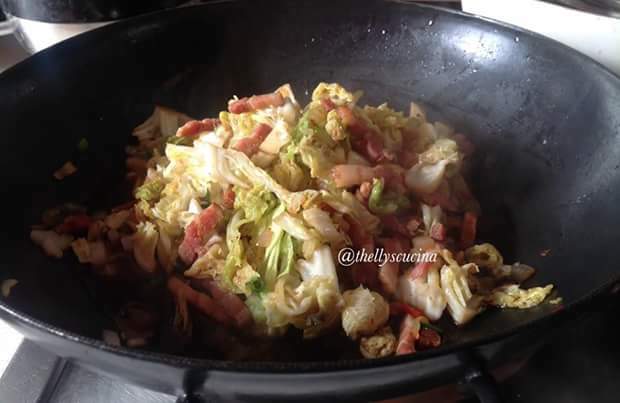 With the remaining bacon fat, stir-fry the garlic and onions. When the onions are glassy looking, add the fried bacon. Then add the white cabbage and chili. Stir-fry well. 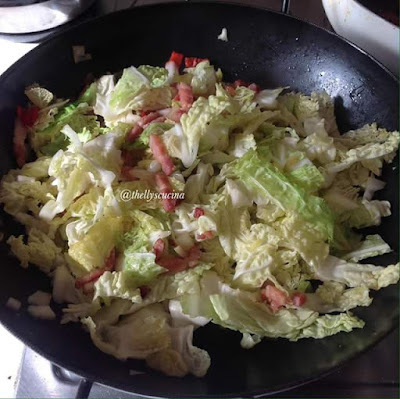 When the cabbage is tender, add the spring onion. 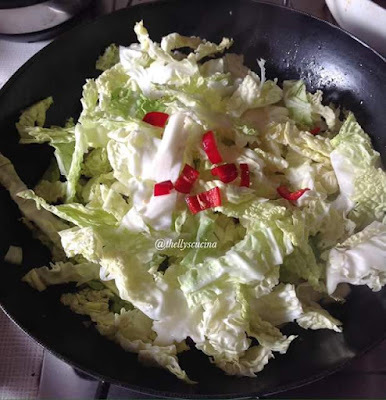 Taste with soy sauce and pepper. If you must, you can add salt. Then serve this with rice or potatoes and meat like sausage or steak. It´s up to you. You can serve this too with a slice of rye or baguette bread. 2 and 3. 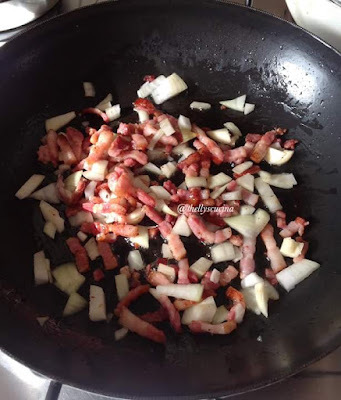 Bacon with garlic and onions. 4. 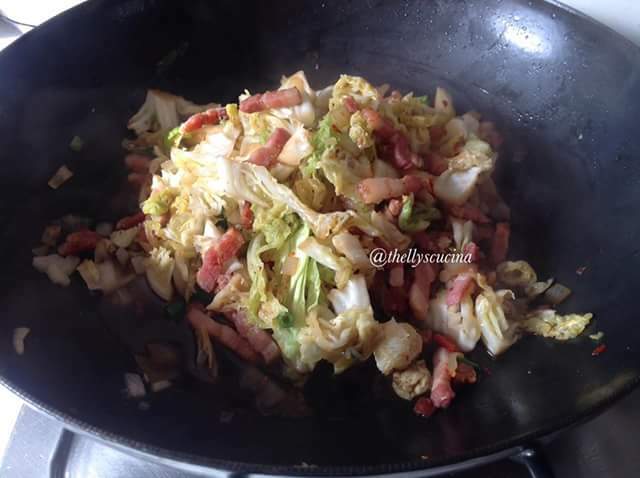 Add white cabbage and chili. 5. Add the spring onions. Taste with soy sauce and pepper. 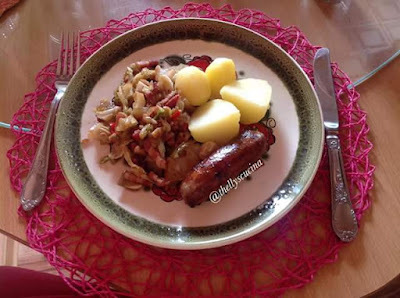 I served this with boiled potatoes and sausage. Sounds good I make fried cabbage all the time and will try your recipe next time I do. Thank you very much for dropping by Susan. Yes, please try this and tell me how you like it. Have a great week ahead. Yummy once again Thelma so quick to do and just a touch of chilli..ha ha...Love it! My hubby is not so fond of chili and so I don´t put much on it;-))) Thanks Carol. It is The Savvy Age. Thanks. Yummy! This sounds so good, I could use a plate of this right now. Me, too Angie. I will be making this again this week. Thank you. This sounds really good. 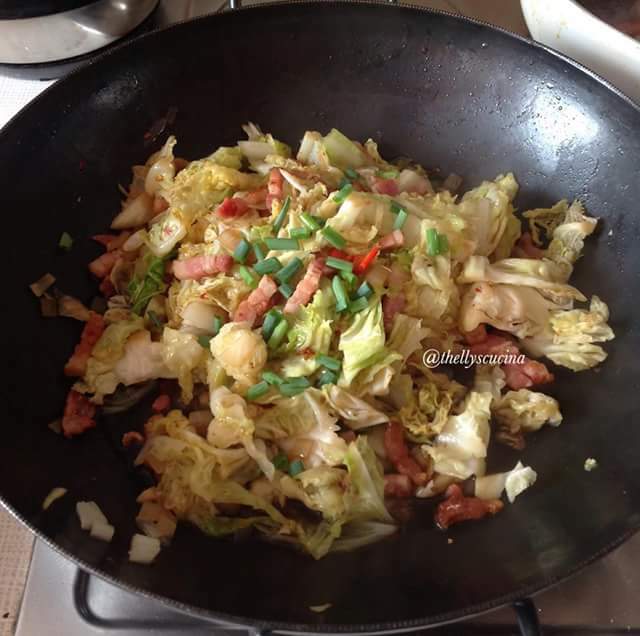 Then again, I'm a fan of both bacon and cabbage. Hi Rex. 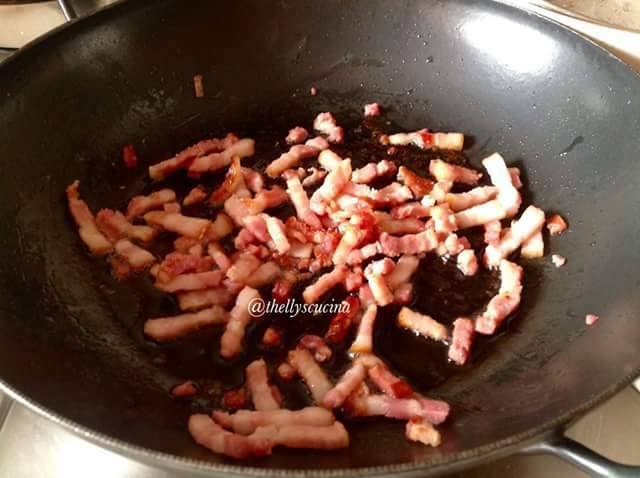 With bacon, everything will be yummy;-)) Thanks for dropping by. Looks delicious Thelma. anything with bacon in it is for sure a must try. Thanks for sharing.